Bloom is a sculptural lamp inspired by the moon flower (botanical name: Ipomoea alba), a flower that only opens in the night. I am interested in natural forms and how they grow, develop, and evolve. In researching patterns in nature, I was led to the golden spiral, which reveals itself in structures such pinecones or sunflower seed patterns, the nautilus shell, or the curl of a wave as it approaches sand. Absorbed by these dynamic images, I came to design Bloom. 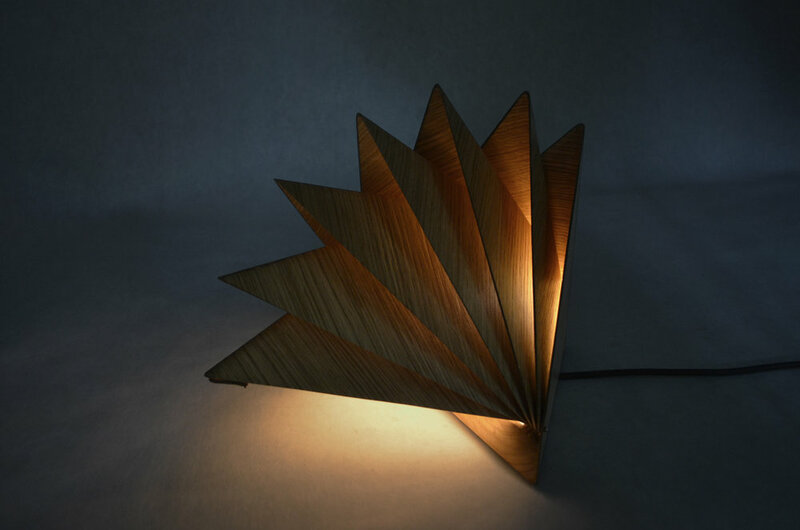 The lamp gives you a chance to play with light and with the mood of an environment. In getting to the final piece, the balance and integration of organic and geometric became paramount. Therefore, the fabrication required both traditional craftsmanship and technological engineering. To start, we made a foam core and vellum mock-up to get an idea of form and movement. Following this prototype, a 3-D model was necessary. We modeled in Rhino and 3-D printed a miniature lamp to understand how the layers should fit together and, most important, how the pivoting joint should be engineered for manufacturing. 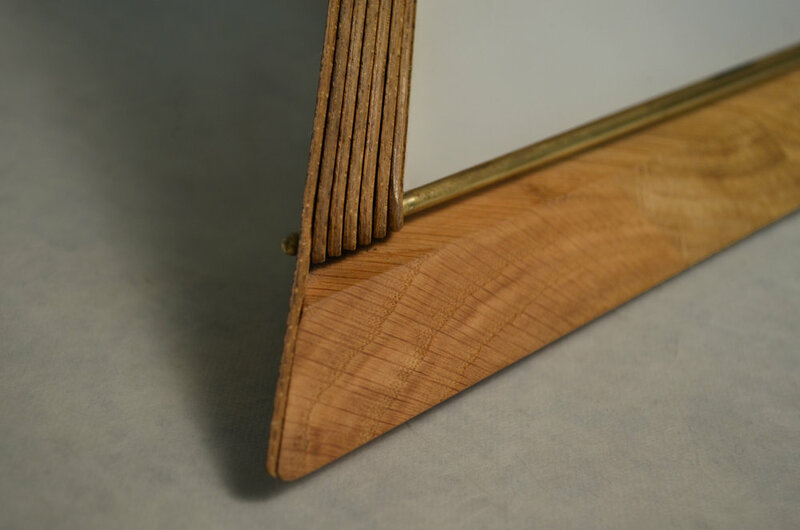 Our next challenge was to test the boundaries of bentwood to find how thin the veneer of the panels could be while maintaining a rigid structure. 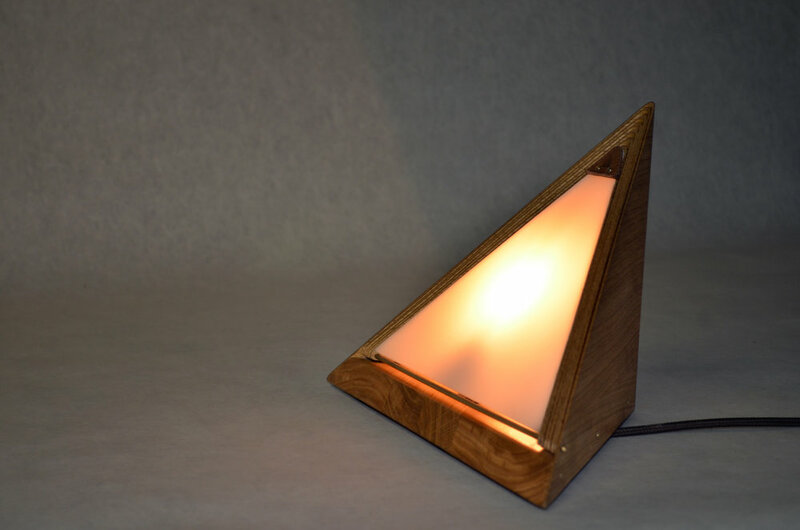 Through experimentation of techniques and materials we discovered and recognized the solutions to fabricate this lamp. A huge thanks to my friends and my partner, Gregory Hall, for executing this design. Born in New York City in 1988, Klara Varosy is a multidisciplinary designer and artist based in Amsterdam, the Netherlands. Motivated by curiosity, she explores materials, concepts, and aesthetics and enjoys discovering through hands-on experimentation. Much of her work plays with the intersection of traditional craft and current production methods. She studied fine art and industrial design at Pratt Institute in Brooklyn, New York, where she graduated in 2011 with a bachelor’s of industrial design. She works as a freelance art director at Frans Beekwilder BV, a display design wholesaler, and an assistant project manager and decorative designer at Fiction Factory, a decor and interiors engineering and fabrication company. Previously, she spent three years as a display designer at Anthropologie in New York City. In 2014 her team’s holiday window display at Rockefeller Center received the “Gold Award Winner Best Holiday Windows NYC” award from design:retail.